This week I am spending most of my time painting the line-art from The Galactic Adventures of Zish and Argo. One of the things I really like about watercolors is that they travel well. I’m on the road for the next couple of weeks, but it is just as easy to paint here as it is at home. A major reason for the portability is the type of materials I use. I bought a Windsor-Newton field box set several years ago, pictured below. At $50, you might experience a bit of sticker shock. I’ve only recently had to start replacing pans; it lasts and lasts. I have used the liquid watercolors as well. I find I enjoy the quick set up of the solid colors. There is no need to dole out paint as you go, and you only use what you need. Plus it’s easier to travel with. The solid paints can still deliver good intensity and brightness. 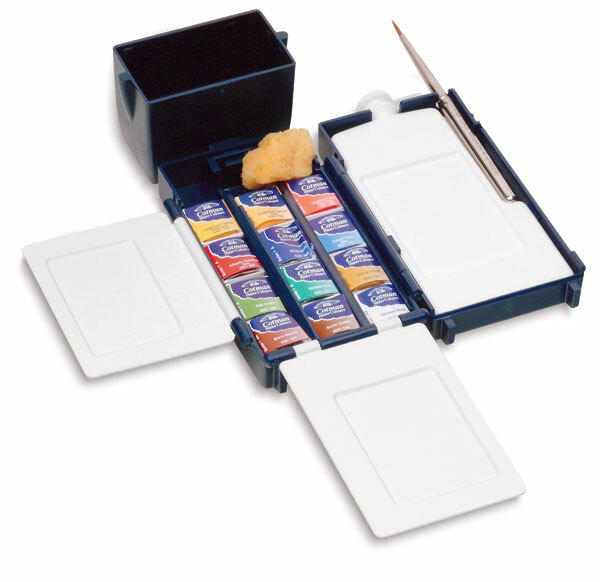 I roll all my brushes up in a bamboo case like this one, and then I’m ready to go anywhere and paint anything. If you have a pigment-ink printer, you can economize on your watercolor paper by selectively choosing what you print. I discuss that more in an old entry, here. I read a watercolor book a few years ago that I found helpful as well: Watercolor Tricks and Techniques, by Johnson. If you are curious, it is worth a look. So there are 13 paintings for the core of the Zish and Argo book. I have 7.5 paintings done, so I’m over halfway! The Robotoids say hello!! This entry was posted in Current Projects, Illustration, Methods, Zish and Argo and tagged art, arts, book, books, current work, fiction stories, Illustration, painting, project, science fiction, water color, water color paintings, watercolor, watercolor book, windsor-newton, zish and argo on December 19, 2012 by Vironevaeh.